Is the Housing Recovery at Risk? One of the more senseless arguments I hear being made over and over again is that an increase in mortgage rates will not affect the housing recovery because rates are “still low by historical standards.” The reason this makes no sense is that houses (and other types of residential real estate) are purchased using borrowed money, and therefore housing prices are largely determined by, and will inevitably fluctuate with, the cost of money. The only thing that matters is the directional change in mortgage rates compared to recent history, not compared to 10 or 20 years ago. What difference does it make to me now that someone had to pay 10% for a mortgage in 1990? The answer is that it does not matter at all. Let’s use an example to demonstrate. Let’s say it’s April, 2013, and I am looking to buy a condo that has been listed for $250,000. I call up my friendly neighborhood mortgage broker (who incidentally is also being flooded with calls by people seeking to refinance), and he tells me that I can get a 30-year, fixed-rate mortgage at 3.50% as long as I can make a down payment of 20%. He runs the numbers and tells me that my monthly payment, including principal and interest, will be about $898. Excited by the fact that my payment will be under the $1,000 per month that I had budgeted, I decide to raise my offer to ensure that I will not be outbid. So I ask my mortgage broker how much I can offer without going over my budget. He quickly runs the numbers again and says that I can bid close to $280,000 without exceeding my $1,000 maximum. (It should be noted that my down payment will also increase by $6,000) Armed with this data, I submit my offer at $280,000 – 12% higher than the original asking price – so that I can be sure to exceed the next highest offer. My bid is accepted, and I lock in a low 3.5% borrowing cost for 30 years. Now let’s see what happens if I had decided to wait rather than engage in a bidding war. The month is now August, 2013. Following an improvement in economic data and several hints by the Fed that it may begin to “taper” its asset purchases, mortgage rates have risen about 100 basis points to 4.5%. All of the sudden I find myself in a situation whereby my monthly payment for that $250,000 condo will modestly exceed my $1,000 budget, even without raising my offer price! The same property that I decided not to pursue in May will now cost me 13% more per month. 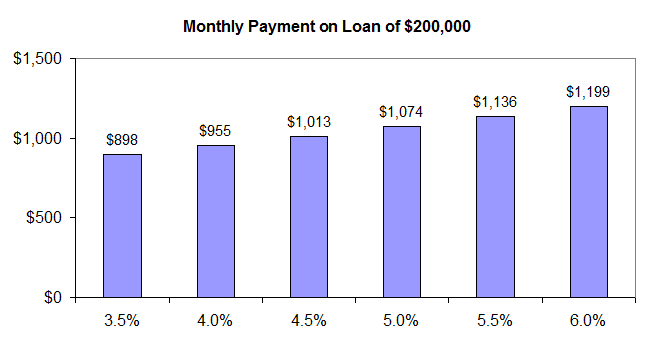 Below we show the sensitivity of monthly payments to increases in mortgage rates. 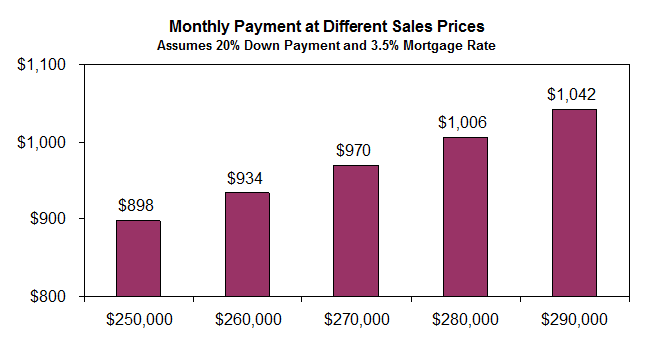 Based on the higher cost of financing, I will be much less inclined to raise my offer price. This is exactly what is happening across the housing market right now. The improvement that we are now seeing in housing prices (up over 12% year-over-year in May based on the Case-Shiller 20-City index) was triggered by a sharp increase in housing affordability. The housing affordability index increased from a low of 102.7 in the second quarter of 2006 to a high of 207.3 in the first quarter of 2012. The increase was driven by plummeting housing prices combined with a rapid decrease in mortgage rates. Now that housing prices have rebounded somewhat and mortgage rates are coming off their lows, affordability is decreasing. The latest reading we have for housing affordability was 175.4 for the second quarter of 2013. The index has come down 15% from its highs already, and this does not even include the full effects of the recent spike in mortgage rates. At the same time, the other inputs that determine housing affordability are not very encouraging. It is true that the unemployment rate has dropped significantly, but many of the jobs we have added are part-time and lower-paying gigs. The economy is not creating the kinds of jobs that lead to a healthy and robust middle class. Based on these three factors – stagnant incomes, higher housing prices, and rising mortgage rates – we would expect housing affordability to continue to decrease in the quarters ahead. For months our message has been that there will be a ceiling on the pace of economic recovery (including the housing recovery) due to the Fed’s need to extricate itself from the bond market. The artificially low interest rates we have enjoyed over the past few years will inevitably need to rise as the Fed gets out of the way. However, as we are now seeing, attempts by the Fed to begin extricating itself are leading to sharp corrections in the bond markets. These unintended consequences are unavoidable. The Fed has dug itself into a hole by opting to minimize the depth of the economic recession in favor of prolonging its effects. In other words, the Fed’s chosen course of action comes with a cost. 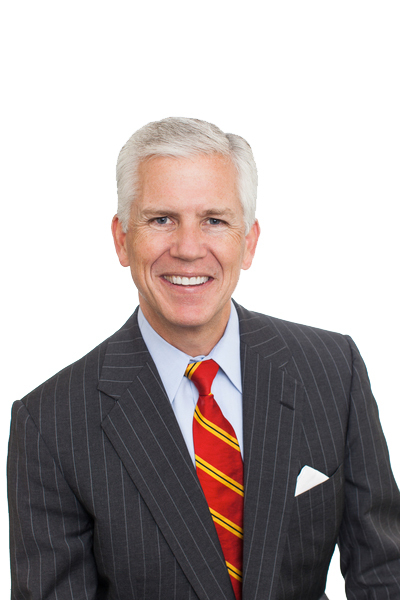 We expect continued lackluster economic growth for the next several quarters. Incidentally, the same cost/benefit tradeoff applies to fiscal policy as well as monetary policy. A few years ago, I was privileged to be a co-speaker at the University of Delaware’s annual Economic Forecast with Philadelphia Fed President Charles Plossser. Plosser said that the Keynesian proposal to have government increase its spending to pick-up economic slack during times of contraction was flawed. Plosser suggested that while near-term economic pain is avoided, the period of recovery is lengthened and the amount of debt is exacerbated. We have reached the point for exit, and it remains to be seen if the ultimate pain will be avoided. Our foremost concern is that should rates climb faster than the Fed can control, the economic recovery could easily stall. We continue to favor a long-term investment horizon and well-capitalized and defensive multinational stocks. Markets fluctuate dramatically in their long historical climb higher. No one likes downside volatility, but it is an unavoidable part of investing. Emotion is the foe of the long-term investor. Stay calm. Be disciplined in your research and true to your philosophy. The road is starting to feel bumpy, but this too shall pass.